This year’s Geneva Motor Show is scheduled for March 2012 and as always it is going to play a very important role as many global majors will be using its stage to unveil their new products. Recently we covered the next generation Mitsubishi Outlander, 2013 Hyundai Elantra Coupe and 2013 Hyundai Elantra GT which will be unveiled in Geneva next month and the next car to join this list is the Chevrolet Cruze station wagon. 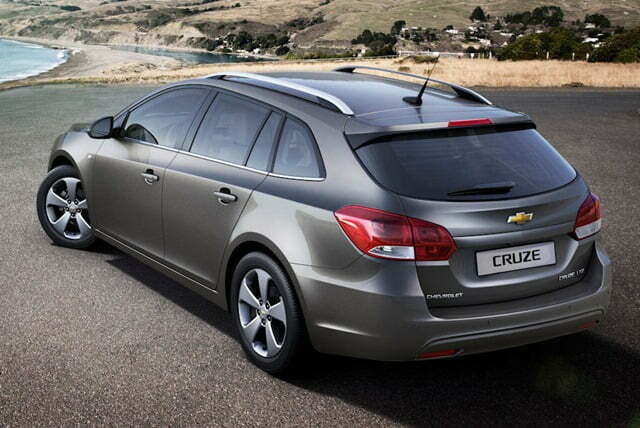 This station wagon from Chevrolet(General Motors) will be the third variant of the popular Cruze line-up and will flaunt a new engine line-up as well as a number of new technologies. Along with the Cruze station wagon the company will introduce an improved engine line-up available with all the Cruze models. Beside the ongoing 1.6 litre and 1.8 litre gasoline engines the company is going to offer a new 1.4 litre turbocharged gasoline, a new 1.7 litre diesel and an improved 2.0 litre diesel engine. All the engines are Euro-5 compliant and come with Stop Start System. Dimension wise the station wagon is 4,675 mm in length making it slightly longer than the sedan and hatchback models. Some of the key changes brought by GM include a restyled front fascia, modified head-lamp interiors and fog lamps, new wheel styles on the exterior, improved center console and more choices for upholstery on the interiors. A very interesting feature to come with Cruze SW and other Cruze models is MyLink infotainment system. This system is capable of transferring the functionality and content of your smart phone to the 7-inch high resolution colour touch screen display. Once your phone is connected you can access personal playlists, photo galleries, phone books, videos and other stored media and data, such as a special navigation app, through the infotainment system touch-screen.